All results are displayed in units of 106km2. Furthermore, match-up tables of grid counts of first year ice in model vs. observations are provided separately, follow the link Contingency tables to the upper right to display these tables. Note that results are also produced for three subregions. Validation of the CMEMS Arctic MFC results for sea ice type is performed using the ice type data from the CMEMS Ocean & Sea Ice TAC. The region for which the observational product is available, is shown in the sample snap-shot below. Shown here are the conditions for 2016-12-01. In the validation, first year ice is assumed to be represented by Relatively young ice. 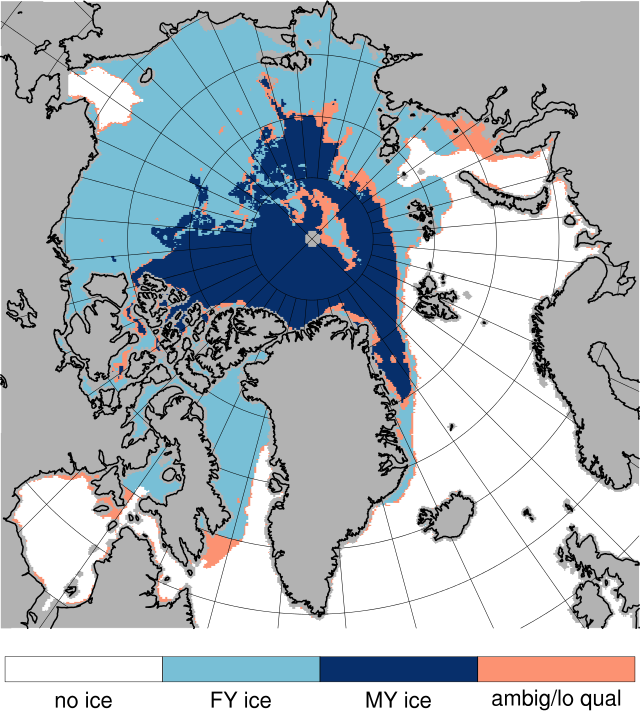 Ice type data are available as aggregated ice type (CMEMS product SEAICE_ARC_SEAICE_L4_NRT_OBSERVATIONS_011_002). In general, one should be aware that observational data are not identical to truth. First, instrument inaccuracies (or even errors) contribute. Next, frequently the observations are indirect measures of the quantity that is reported (e.g. measured radiation from a body from which its temperature is derived), adding to the uncertainty that is due to instrument inaccuracies. In the present case, an advanced algorithm is applied to derive a gridded product for regions that are infested with first year ice, and those that are infested with multi-year ice. While the advanced algorithms that applied are state-of-the-art for the present purpose, the accuracy of the ice type product may reflect the number of steps needed to be impemented in the present production.